Alec Burleson delivers a pitch during his start against the Thunderbolts on July 25. 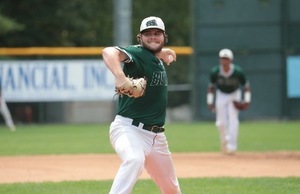 After a rain delay halted the first game of the CRCBL semifinals for the Big Train on Wednesday, Bethesda came back out strong to finish the last inning and a half, winning 4-1 and taking the 1-0 lead in the three-game series. Jacob McCarvel (Cal Baptist) started the top of the ninth for Bethesda on Thursday, after a sudden deluge halted the game in the middle of the eighth on Wednesday. He kept the Big Train’s lead intact with three quick outs to end the game. Alec Burleson started off the offense for the Big Train in the fourth, knocking the first pitch he saw into left-center field for a double. A two-out single from John Glenn (Cal Baptist) drove in Burleson, and Glenn came home on a double from outfielder Jacob Westerman (San Francisco). The two runs put Bethesda ahead 2-0 in the bottom of the fourth, giving Burleson some breathing room for the fifth. With that wiggle-room, Burleson worked through a jam in the fifth, giving up one unearned run but struck out one and forced a fly-out to get out of the inning with the Big Train still on top. He went a full five innings, giving up one run and striking out six. Relievers Ryan Metz (VA Tech) and Hunter Brown (Wayne State) worked through the sixth and seventh. Brown entered in the top of the seventh with two runners on, striking out two in a row to work out of the jam. "I mean honestly you're coming in and looking for the strikeout," said Brown. "Because, really anything in play that's not a pop-up will help them out. And it just so happened that I got two and worked out of that inning." With Brown on the mound holding the Thunderbolts at bay, Fox Semones (James Madison) sent a ball flying over the left-field wall for a two-out, two-run homer. The knock gave the Big Train a 4-1 lead heading into the eighth inning. "Fox is a great player," said head coach Sal Colangelo. "We have guys every evening, someone steps up, a big hit, a big strikeout or something. It was Fox's night." Brown reentered in the eighth, working out of another two-on jam, striking out a batter with three pitches. The Big Train take on the Thunderbolts for game two of the three-game series Thursday, scheduled for a 7 p.m. start at Shirley Povich Field.